A mere one week after the 2-3 inches of rain in the Austin area, we are experiencing a fall nectar flow that the girls are loving. Both of my hives have completely drawn out an 8 frame super each and have started filling them up with honey. 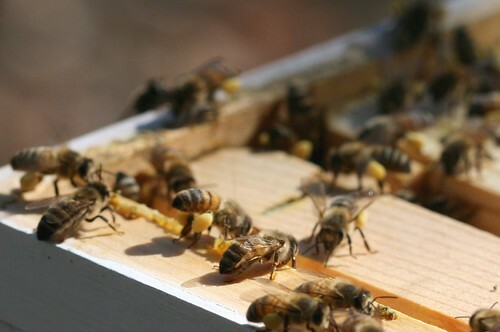 Pollen is also plentiful and bees are returning to the hives filled to the brim with bright yellow pollen. 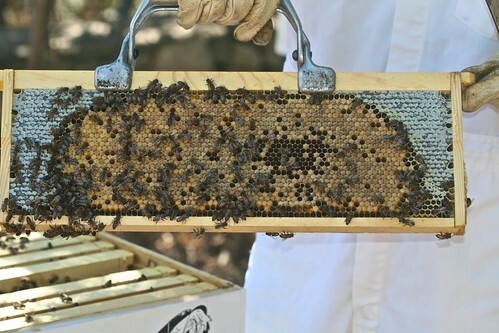 This is a picture perfect frame from Knives’ hive of brood in the middle with capped honey on the outer edges of the frame. 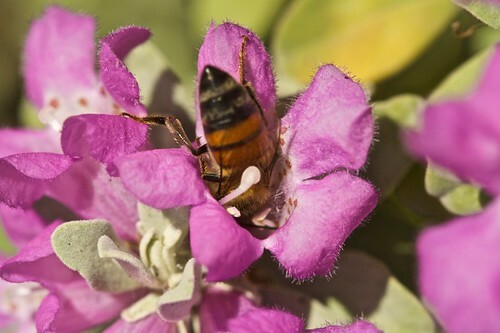 I encourage all my fellow Central Texas beekeepers to check their hives this week as you may be surprised by the amount of activity in your hives. It always amazes me how quickly bees can fill up a super with a good nectar flow so don’t be caught off guard and make sure your hive has plenty of room to accommodate this boon. 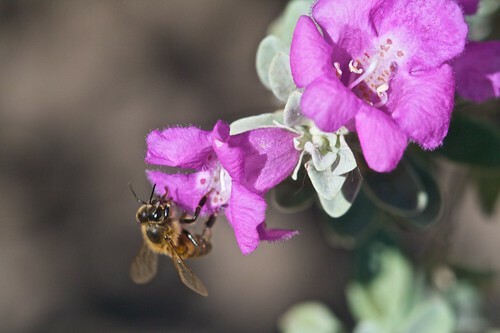 This Saturday the Austin Urban Beekeeping Group will be meeting at the North Village Branch of the Austin Public Library from 1:00pm to 3:00pm. We will be discussing fall tasks for the Central Texas Area as well as preparing for winter. I hope to see ya’ll out there. Leucophyllum frutescens, most commonly known as the Texas Barometer Bush, is said to bloom before a rainfall. This bush in my front yard burst into bloom in the middle of one of the worst droughts Texas has ever seen about a week before the rains finally came to Central Texas. The bees in my neighborhood definitely appreciated the pollen and nectar and were all over this plant. Texas is finally getting some much needed rain, and we are expected to get up to 3 inches through Tuesday. Hopefully this is the start of better weather for Austin and perhaps a fall nectar flow is now not a distant dream. My wife and I spent a lovely few days in Albuquerque, NM last week where we had the pleasure of meeting Chantal Foster and her husband Alex for dinner. Chantal is a local beekeeper in the Duke City, and her blog is chock full of good information, and is one I used extensively when I first started out. In addition to talking shop, we exchanged honey from our hives. Now that we are back in Austin, Gitanjali and I decided to make a lunch of delicious meats, cheeses, and fruit paired with honey. Just from the picture alone, you can see the two honeys are very different in color. 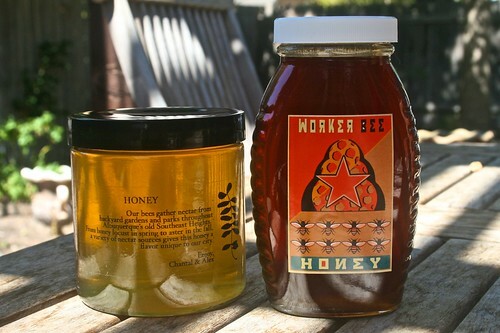 Chantal’s honey is also much thicker than ours most likely due to the arid climate in New Mexico. We feel her honey has a more fruity and floral taste, and we even get a hint of pineapple in the finish. It paired very nicely with a La Tur from Alta Langa, Italy. Our honey on the other hand has a bolder deeper flavor that paired well with blue cheese particularly a Rogue River Blue from Rogue Creamery in Oregon. Both honeys are completely different in taste which just goes to show how the local environment and native flora influence the final product. We had a great time in Albuquerque and were happy to bring a taste of New Mexico back to Texas with us.